Contest has closed. Congratulations! Joanne Lee is the winner. The holidays will be here before we know it! 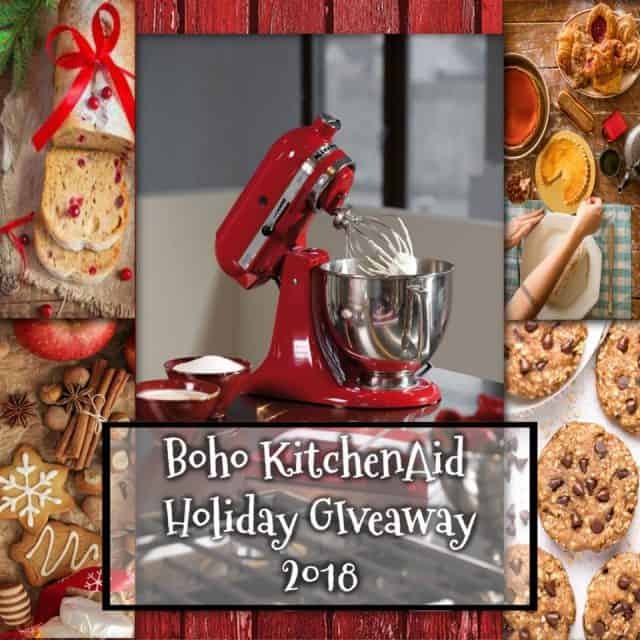 How would you like to win a brand new 5 qt KitchenAid stand mixer in candy apple red!?! Wouldn’t that be a wonderful gift for the holidays? It would be so helpful with cooking and baking! I love my KitchenAid and can’t live without it! I just have one mandatory option for this giveaway: In the comment section, please tell me what you would do if you won the mixer, keep it or give it away? Click on the Rafflecopter below to enter to win. The more options you complete, the more chances you have of winning. The only mandatory option is to leave a comment below the post – We want to know what you would do with the mixer – keep it or give it to someone special for the holidays? ENTRIES Valid in the USA. I would gift this to a friend who had to sell hers last year to cover an unexpected house expense. She would be so thrilled to have a Kitchenaid again! If I won I would keep it! Right now I don’t have a mixer and having to mix batters my hand can get so tiring! I have arthritis in my left hand so this mixer would be such a blessing! As much as I’d love it, I’d gift it to my Granny! She still makes all of our holiday sweets! breads, pastries, cookies, pudding…. ALL BY HAND since her mixer died 2 years ago! She would be making more than our holiday sweets, she’d be making memories with us & her great grand babies! I would use this to mix batches of holiday cookies…big batches….all kinds! I wish I could give away the mixer, but to be honest, I need to replace my current one. I have a bakery out of my home, and with holiday orders coming in, a new mixer would be a blessing! I would keep it for myself. I’ve always wanted one of these mixers. I would keep it. Both my sisters tell me how great they are and my teen daughters are getting into baking now. This would be the perfect time for me to win this giveaway. I have 3 daughters The oldest 2 have received their KitchenAid mixers already. The youngest just graduated college so it would be the ideal way to gift on to her! I would keep it. Have been wanting/needing one since the longest. Will make baking a lot easier especially dough. If I win, I will give this as a gift. I have a special someone in my life who really deserves it (my daughter). I would keep it for myself and bake my little heart out!!!! I would keep this for myself as I need a new mixer. I would keep the mixer, I’ve always wanted one. And I’d be able to bake more with its help. I would keep it! So much better than my hand mixer. I would keep it for myself because I have never had a mixer and usually mix everything by hand. I would make cookies first thing! My mixer has seen better days so I would keep this one. I would give the mixer to my best girlfriend! I inherited one (avocado green) and it sadly died from 30 years of use. I would love to have a Kitchenaid again. I would make pizza dough in it and have a party! If I won I’d be tempted to keep the new one and pass down my old one to my little sister or new sister in law! I would give this to my Mother as a gift. I would love to win this Kitchen Aid and give it to my sister for Christmas. I would give it to my daughter as I’ve had my red Kitchenaid Mixer for about 20 years and it still works great! I haven’t decided whether I would keep it for my husband and myself or give it to my brother-in-law who does quite a bit of the family baking. If I were the lucky one to win this I would keep it for myself. I could not afford one ever and did buy one off of eBay at a reduced cost but it did not work properly. I have wanted one always since I learned to bake from my grandmother who had a KitchenAid and I learned to use it then. 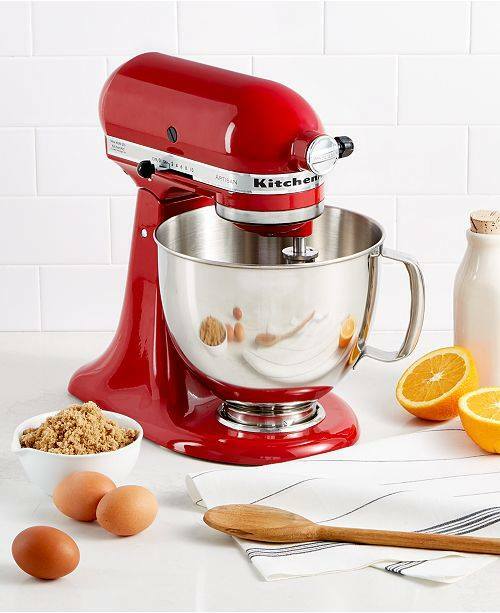 I would keep this–I’ve been wanting a KitchenAid mixer for years to replace my current less quality one! I would use it to bake with my girls. I also just started eating low card, I could use it to make new recipes. Give it as a present to my mother❣️❣️❣️ she works soooohard and she desserves best and i would give it to her with all my heart… i wish i could afford and buy it, but i can not… 🎅dear santa pleaseeeeeeeee….. If I were to win the KitchenAid, I would keep it for myself as the one I have does not work anymore and cannot afford a new one at this time. I love KitchenAid. Who doesn’t? If I were to win this KitchenAid I would make my daughter’s wedding cake that is coming up. I have a KitchenAid that is not working anymore due to some issues from where I did buy it and it was old. I love this product and it is the best kitchen appliance. I’d keep it—I don’t have one! I would keep it and double all of my cookie recipes. I would give my niece my smaller kitchen aid.